Hola chicos, if you are regular reader of my blog you will know that I have 2 girls, Bella who is 5 years old and Sienna who is 16 months. They are really active kids and it can be difficult to keep them entertained. I’m really bad at craft but my girls love doing this type of thing so I was really desperate to find some crafting ideas in order to entertain my girls. 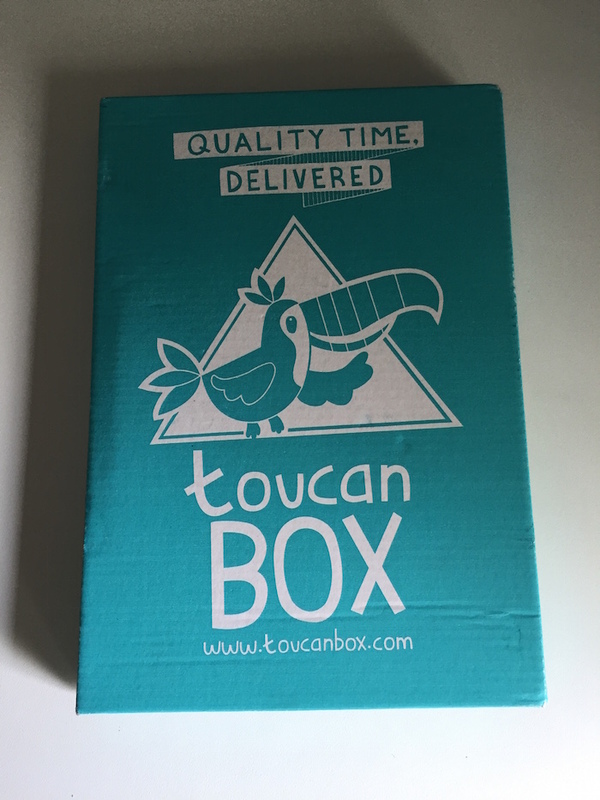 Whilst searching online I came across a subscription service called Toucan Box. I like subscription boxes (I have a beauty one that I absolutely love) but I always want to be sure that I’m happy with them before I commit to a monthly payment. Toucan Box were offering a first box for free as a trial so I thought: Lets give it a try!! Why not, right? We received our first trial box which had Bella’s name on it so you can imagine how happy our little cheeky monkey was when she saw it, LOL! So, what is Toucan Box? 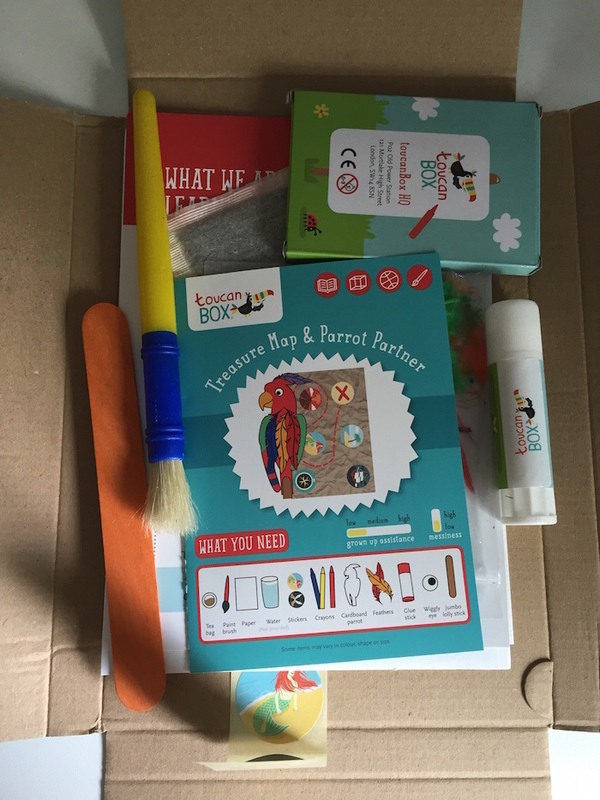 It is a craft box delivered fortnightly aimed at 3 – 8 year olds, so this box is really perfect for Bella although Sienna was happy to be involved too. As you read before, it comes personalised with your child’s name which is always a cute idea! Each box contains a unique craft project. 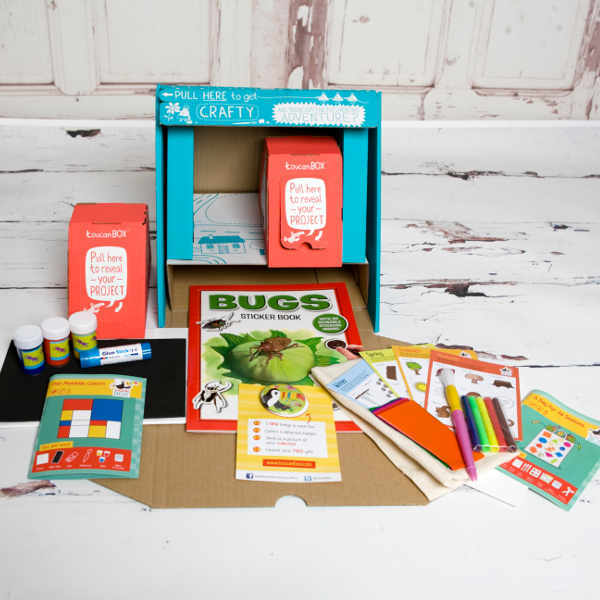 Inside each box you will find all the materials you need to build a fantastic craft project with your little one. Also you will find illustrated and easy to follow instructions. It also has suggestions for more exciting craft ideas. 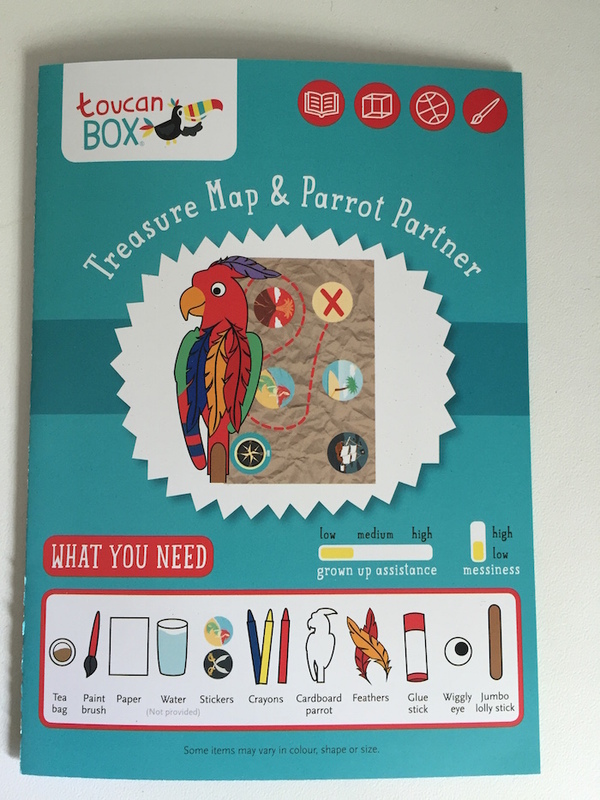 The box that we received was called ‘Treasure Map & Parrot Partner’ where we had to create a treasure map and a cute parrot. Daddy is very good with these kind of activities so he helped Bella with this craft (as I mentioned before I’m not very good at it although if I make an effort I’m sure I will be able to help Bella as the whole box is very easy to follow). I did a video of them which I enjoyed filming and also it was great to see how much fun they were all having!! Including little Sienna!! ha ha. 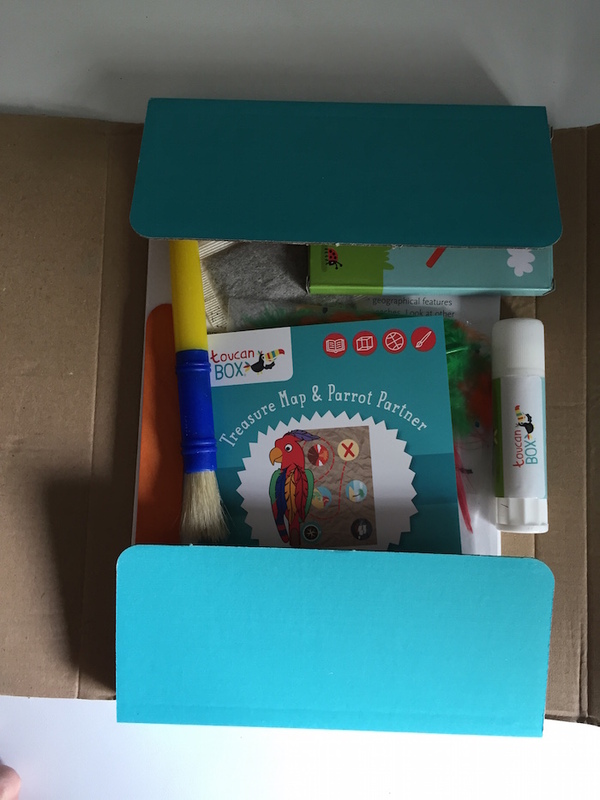 When we subscribed we got our first craft box for free and then we had a whole 7 days to cancel our account after our box had been dispatched if we were unhappy. We were happy so we kept the subscription. Normally this box costs £3.95 (+£0.98 postage) per fortnightly delivery. They have 3 different subscriptions: Petit (which is the one we received), Grande (£9.95 + £2.99 postage per month) or Super (£16.99 + £2.95 postage per month). 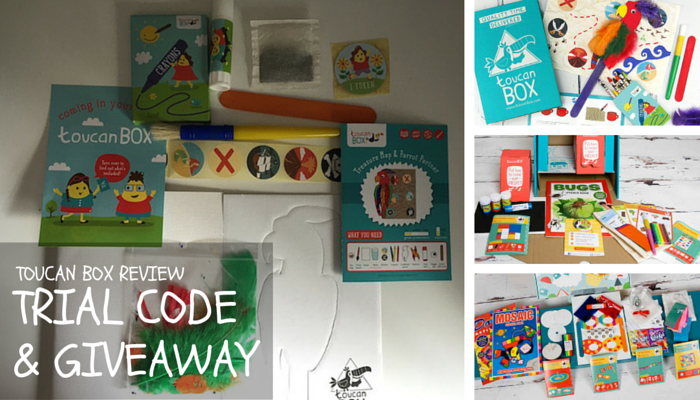 A discount code for all my lovely readers to get the first box for free like me! They created a unique code for my blog so I can share with all of you. The code is franca1. What you need to do is simply visit HERE and enter the code “franca1” to claim your first Petite subscription box for free! Isn’t it great? I’m sure you will love it! This is a great way to try this box first. 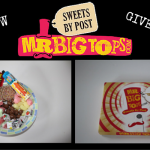 If that is not enough, the lovely people at Toucan Box are being so kind and have given us the opportunity to run a Giveaway!! Yaay!! 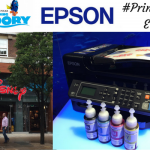 I love Giveaways and I’m sure you do too!! For more details of the Giveaway please check the bottom of this post. I think this is a great product which will help parents like me that don’t have enough imagination to come up with your own craft ideas (it sounds like I have no imagination whatsoever lol, but you know what I mean!!). It creates a nice and fun moment to get involved with your kids and it is very easy to follow the instructions. Your children are entertained for at least an hour or two! For me that is a plus. I like that they are very flexible with their subscription so you upgrade, downgrade or cancel your subscription at any time. I think from all 3 options I would go for the Grande Box option as receiving a box once a month is better than receiving a box every 2 weeks. It comes with 2 activities in 1. I guess some people will say that it could be pricy but for me £9.95 + postage per month is perfect if I will get everything that I need in order to keep my kids happy and entertained. I’m sure that subscription boxes are not for everybody but for those people that like them I will recommend this box as it is really good value for money. You can find Toucan Box on Facebook and Twitter, Instagram and you can also browse around their boards on Pinterest. 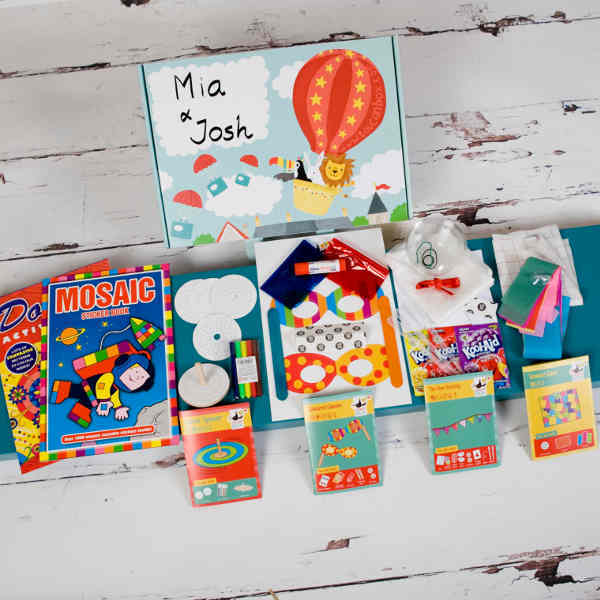 If you are looking for some craft ideas and would like to get all of these ideas and materials inside one box and receive it through your letterbox you have come to the correct place as this Giveaway is just perfect for you! 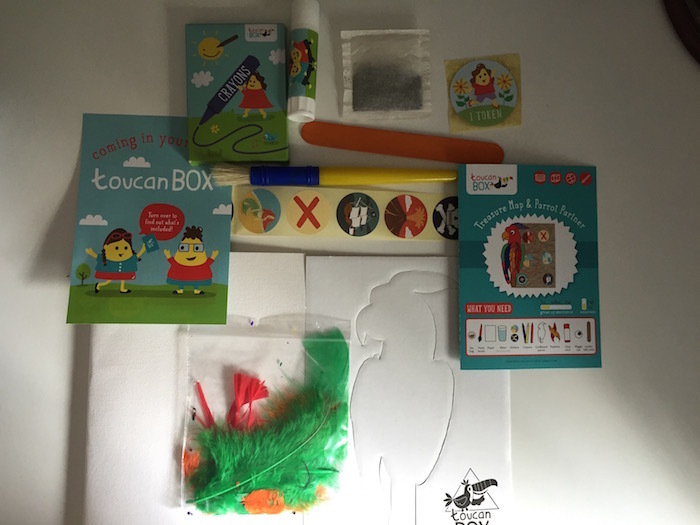 You can win 3 months Toucan Box Petite subscription for free which is a total of 6 boxes that you will receive fortnightly. How fantastic is that? I’m sure your kids would love these boxes! In order to have a chance to win these boxes you just need to enter the giveaway below. Good luck! *Terms & Conditions: Open to UK & Ireland residents. One winner will win 3 months Toucan Box Petite subscription (6 boxes). This prize will be provided by Toucan Box directly. A Moment With Franca blog is not responsible for the delivery of these boxes. 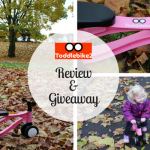 Giveaway closes on Friday 22nd January 2016 at midnight. The winner will have 48 hours to respond once notification is sent. Have you heard of Toucan Boxes before? Have you tried one of their trial boxes? Are you into Art & Craft? Do you like doing craft activities with your kids? Will this box be something that you would try with your kids? Leave a comment below as I would love to hear your opinion. *Disclaimer: We bought this subscription box and we also subscribed to it. Toucan Box only is being involved with the trial code and the giveaway. All of this explanation is my honest opinion. Some photos were provided by them. I have seen them online before and think its a great idea. I love doing arts and crafts with my nieces. We pretty much do something every weekend. We play ‘crafts’ and do anything from cutting, painting and gluing loo rolls to making matchcraft robots. I even have painted nails, not my choice, and I’m a 41 year old bloke. We’ve never heard of Toucan Boxes before but they sound right up our street. I had a free trial box for my daughter about 6 months ago. She was only 2 1/2 years but quite into crafty things so I thought I’d give it a try. I got a box with a flower theme, and already when I looked at it, I realised that it would be too difficult for her. So I unsubscribed and put the trial box in a drawer. At that point, I wasn’t so convinced that I would ever subscribe again either. I’m reasonably crafty and I always had the vision of making up projects for her myself. Really, who was I kidding? About a week ago, full of cold and lacking energy to come up with anything to do with a bored nearly 3 year old I remembered the toucan box in the drawer and it totally saved the day. We made the project and that lead to a few other ideas and we spent a good two hours crafting happily! I have now decided to give toucan box a proper try and have subscribed. Still waiting for the first box but looking forward to it. 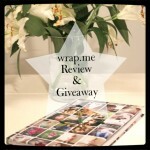 It would be so amazing to win this giveaway as it’s just the right time! We love doing arty stuff in our house anything from baking to painting junk modelling ….you name it we will give it a go! I love crafty things but I seriously lack ideas. These look great! Have you heard of Toucan Boxes before? No. Have you tried one of their trial boxes? Not yet but will do now. Are you into Art & Craft? No but my hubby/son’s dad is. Do you like doing craft activities with your kids? Yes it keeps them busy and hey enjoy it. Will this box be something that you would try with your kids? I think it’s a great idea, especially this time of the year when you can’t get out so much. Yes heard of them before! We love doing arts and crafts but never know what to make, or never have all the right things, so this would be perfect! My sons would be chuffed! This looks like something Sylvia would love as she is really into arts and crafts at the moment. It’s also something we could do together when i’m sick in bed. We love doing arts and crafts – at christmas we did lots – making christmas cards and crackers, we also got sew your own gingerbread sets which were fun! Ahhh i lve your blogs!thiss looks amazing would be grat to do with the whole family for family time! Thank you for this review. I’ve seen these boxes advertised and have been wondering if they would be a god idea. My daughter is very crafty and it is quite hard to keep DIYing ideas of things for her to make. I agree the bigger box once a month would be better than the smaller one fortnightly. I’ll definitely check it out. This looks great, my children love art and crafts. This looks brilliant. I have heard of this subscription before but never really looked into it. It’s definitely something that we’ll think about getting for Rowan when he’s a little older. We are always crafting new creations in our house. Its our way of recycling. I love craft and get up to all sorts with my daughter. We are always making something or doing some cooking etc. allsorts, we like to use up our empty plastic bottles and packaging in general in some crafty way, from making our own money boxes, bowling pins etc. My kids also love a cardboard box, they make them into cars,trains,houses and dolly beds. I love anything crafty I have a A level in fine art so try to do as much craft with my son as possible. Mostly painting and making mosaic pictures. I’m really crafty and am hoping my daughter gets more into it. She currently likes Play Doh, painting, and stickers. We like painting. It can get messy but it’s lots of fun. Being creative with children is really important. We make all sorts of art and have just begun to try paper mache. I am not particularly crafty myself but enjoy helping my grandchildren with their projects. I’m not that crafty but I do try some easy projects with my little girl as she really enjoys it. I think I could be more crafty if I put my mind to it. I think it would be something I would enjoy. I really struggle with crafty things. My son is three and loves building train tracks. I would love to get him into stuff like this but dont know where to start. I like to stick the plain side of wall paper down with tape all over the kitchen table and put on bowls of paint ,glue ,magazines to cut up , potato stamps and crafty bits and pieces ie glitter , polysterene S’s and natural bits and bobs and leave the children to make a frieze which is then stuck up in the hall way for all to see. How perfect, my 3 would love this..even my” tweenager”..just don’t tell anyone! Your girls had fun! You wouldn’t want to wait for a rainy day to try this would you? We like making things that the children can keep and admire their work. I’m not terribly crafty or artistic but I would love to win this for my grand-daughter.My daughter is an artist and it looks like little Millie is going to follow in her footsteps,even at three when you normally only get a blob when they’re painting we have head,body,arms,hands,eyes mouths and hair ! When I’m doing things with her it’s always baking which she enjoys and I’m not too bad at that ! 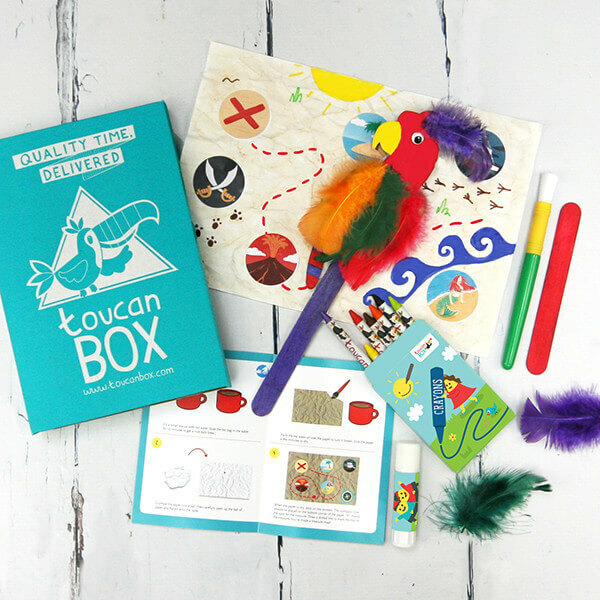 I love doing crafty stuff and science experiments with my children – OI get my inspiration from online and books but the Toucanbox looks ideal! My dayghters loves arts and crafts so fingers crossed at our house! I’m not crafty in the slightest but my nearly 3 year old loves making things so i’m always looking for new ideas of things to do with her! We all love crafting in this house! great for rainy days! I look after my two little granddaughters and we spend loads of time drawing, painting, Sticking, making things and have lots of fun together. My house is constantly covered in paint, glue, glitter and sequins! I love doing crafty things with my nieces so much fun!